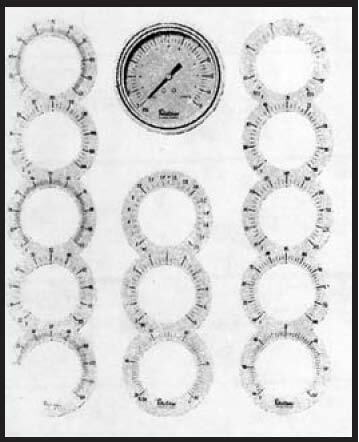 These gauges have a front bezel and a rear clamp to mount in panel doors. They are inserted into the hole in the front and clamped in the rear for a clean panel look. Models shown have 1/4"MPT back connection. Other ranges up to 5000 psi are also available in back and bottom mount. Smaller sizes are also available in 1/8" back mount. 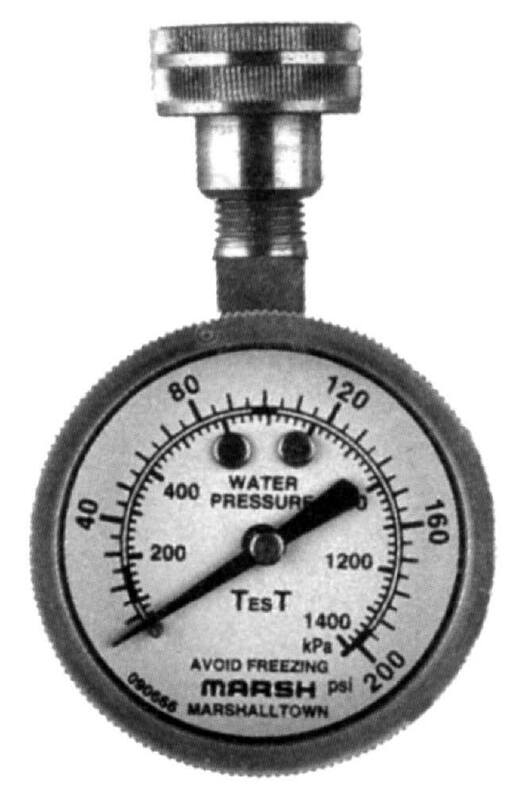 The G24545 Water Test Gauge is designed to connect directly to standard 3/4" water faucet or hose. 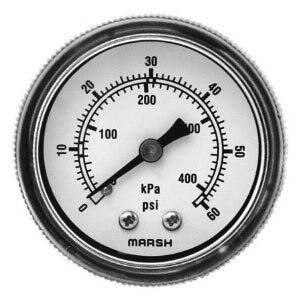 Used to measure water pressure, as well as for selection and adjustment of valves, regulators and other controls. Includes integral hosebib for direct mounting. Dual scale (psi/kPa) standard. 2.5" gauge face. Need more? 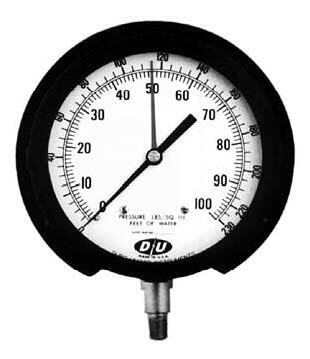 Refer to the PRESSURE section for manometers, magnehelics or air flow devices. 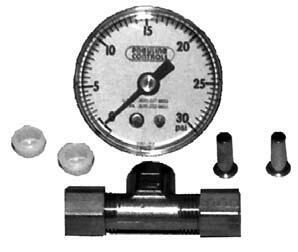 Buy this handy kit for adding a 1-1/2",0-30 psi gauge wherever one is needed. 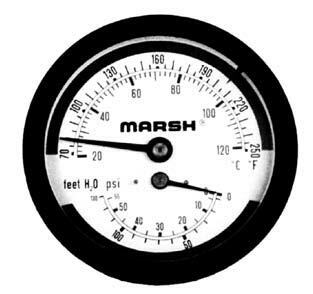 Use it to check in-line pressure for calibration. Use on either plastic or copper tubing. 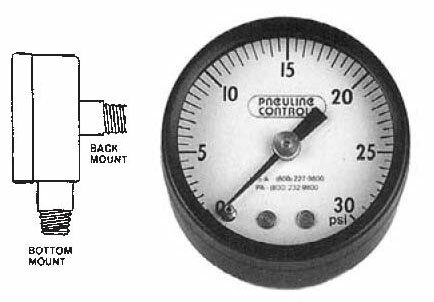 Pneuline Pressure Gauges are easy to read. This assures convenience in the setup and calibration of pneumatic devices. Many other sizes and ranges are available. Use in hot water, chilled water or pneumatic air systems. NOTE: These gauges are the steel case budget model. 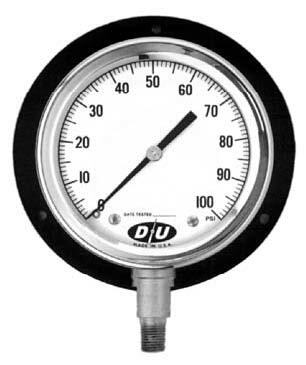 For high quality industrial gauges with a complete assortment of pressure ranges and dial sizes, call your NECC Sales Rep. This handy uni-kit contains a 3-15 PSIG receiver gauge. Pick the range you want from one of the 14 pressure sensitive overlays included in the box. This gives you the flexibility of many gauges from one box. -25° to 125° F 0" to 3" W.C.
0° to 100° F/% R.H. 0" to 10" W.C.
40° to 100° F 30% to 80% R.H.